On arrival at Ayers Rock Airport you will be transferred to your hotel. This afternoon join your Driver Guide and travel into the magnificent Uluru – Kata Tjuta National Park for a drive around Uluru. You'll learn about the World Heritage listed national park as your Driver Guide imparts their incredible knowledge, giving you a greater understanding of the natural and cultural significance of the iconic monolith. Later you’ll take a guided walk to Mutitjulu Waterhole. Along the way you’ll view ancient rock art and learn more about the Aboriginal and European history of the region. Visit Uluru – Kata Tjuta Cultural Centre, for the opportunity to see Aboriginal arts and crafts before heading to the Uluru sunset viewing area. Relax with a glass of sparkling wine and nibbles as you watch the rock change colour as the sun sets below the western horizon. It’s a spectacular sight you’ll never forget. After sunset travel back to Ayers Rock Resort where you can grab yourself a bite to eat from the Outback Pioneer using your dinner voucher. Rise early and travel to the Kata Tjuta Dune Viewing area with spectacular panoramic views over southern side of the formations. You’ll see the morning’s first rays of sun set the red centre alight while you enjoy a warming cup of tea or coffee and a light breakfast of cereal and fruit. 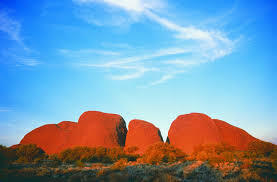 On arrival at Kata Tjuta you’ll commence a guided walk to the Valley of the Winds. First stop is Karu lookout where you’ll have views across the many domes of Kata Tjuta into sacred Anangu men’s area, then continue on to Karingana lookout. This walk can be a little challenging, but well worth the effort. It takes you down into a timeless haven through trickling creek beds and through the valleys between the many domes. The views are breathtaking and you’ll in awe of this natural wonder. Take the time to soak up the incredible atmosphere. Your Aussie Adventure comes to an end in the late morning. You will be offered a complimentary transfer to Ayers Rock Airport for your flight.